I already gave you a sneak peek at our new Christmas stockings, and today I'm going to share a tutorial with you. Hooray! I've had a horrible time lately finding the time to sit down and write up posts, so I'm pretty excited to have this together. 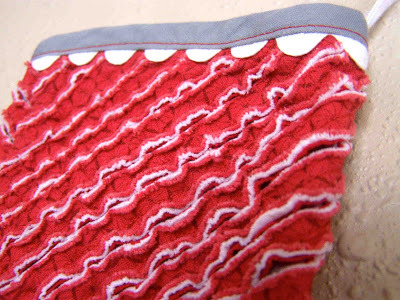 Our Christmas stockings are a red and white faux chenille, much like this blanket that I made earlier this year. 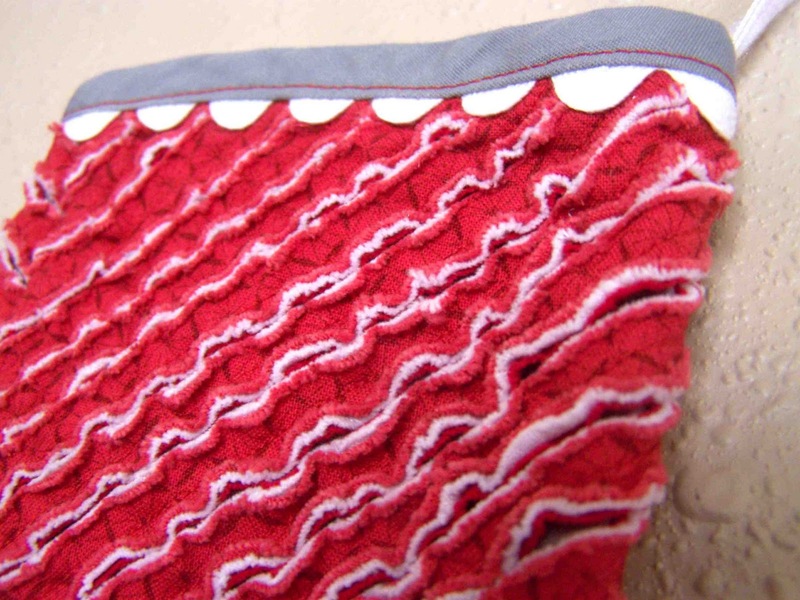 The Chenille look is created by layering multiple layers of 100% cotton fabric, and stitching and cutting them on the bias. 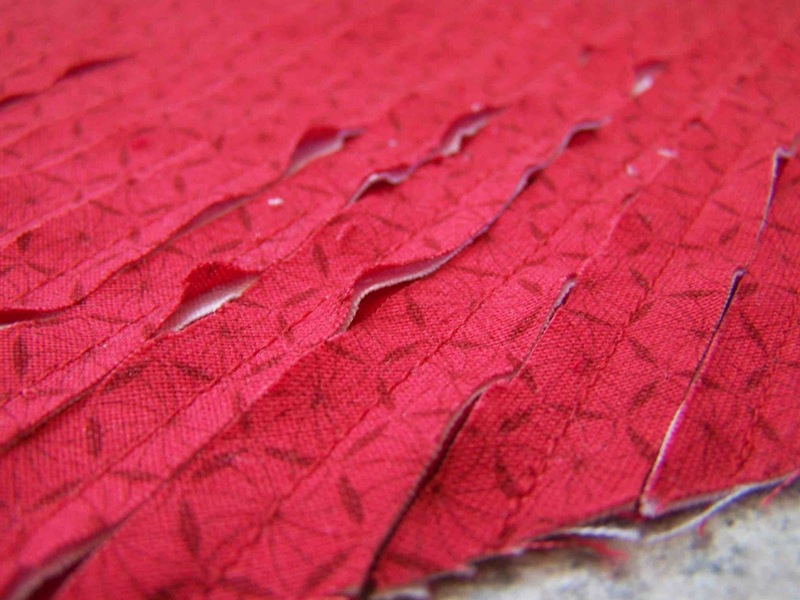 When the fabric is washed it frays up and exposes the different layered fabrics. I thought it would be fun to go for a candy can effect with red, white, and gray. Note: Our stockings aren't huge, so if you want yours to be quite spacious, you may want to scale the pattern when printing. 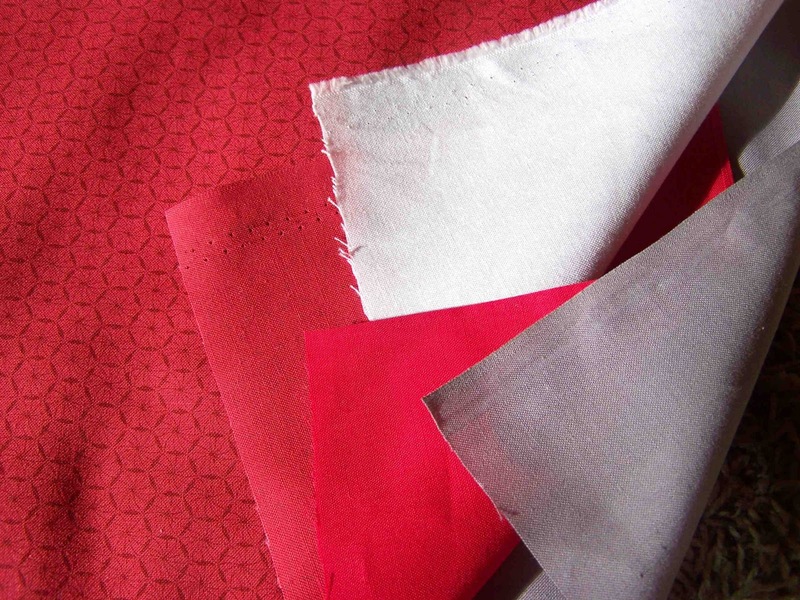 I purchased one yard of four different colors of 100% cotton fabric (cotton poly blends won't fray up as nicely). I used the gray as my base layer for my stockings, and sandwiched my white between two layers of red. I was able to make four stockings with enough fabric left over to make at least one more. 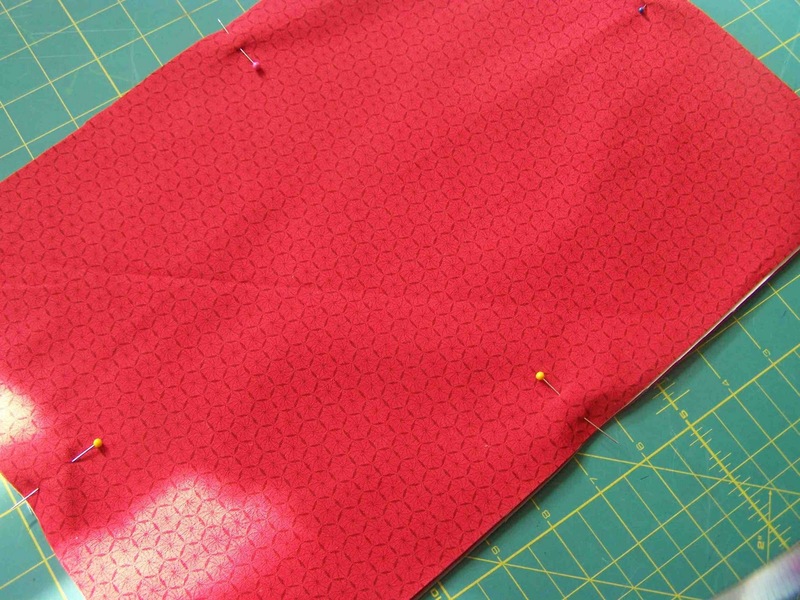 I then cut two rectangles of fabric sandwich about an inch taller and wider than the size of my stocking pattern for each stocking. As you cut out your rectangle you will want to make sure that you are cutting it on grain. 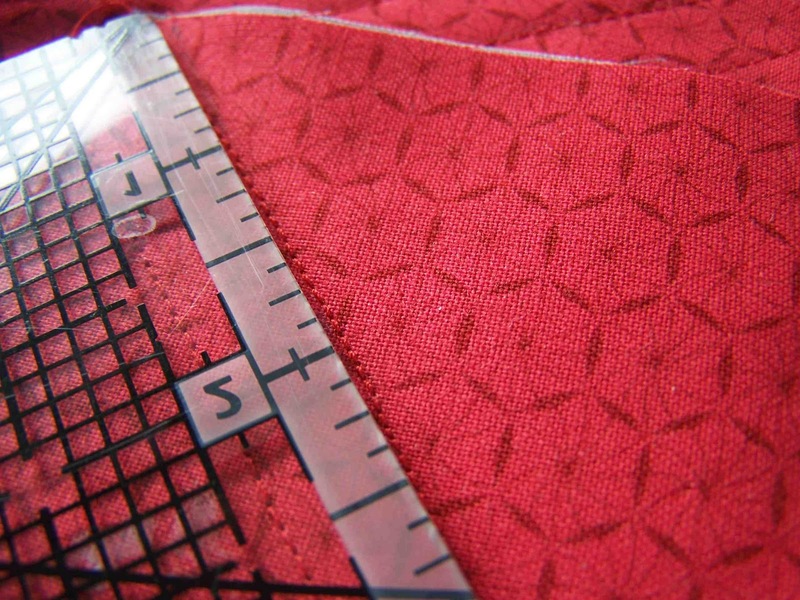 Continue sewing lines 1/2" apart. 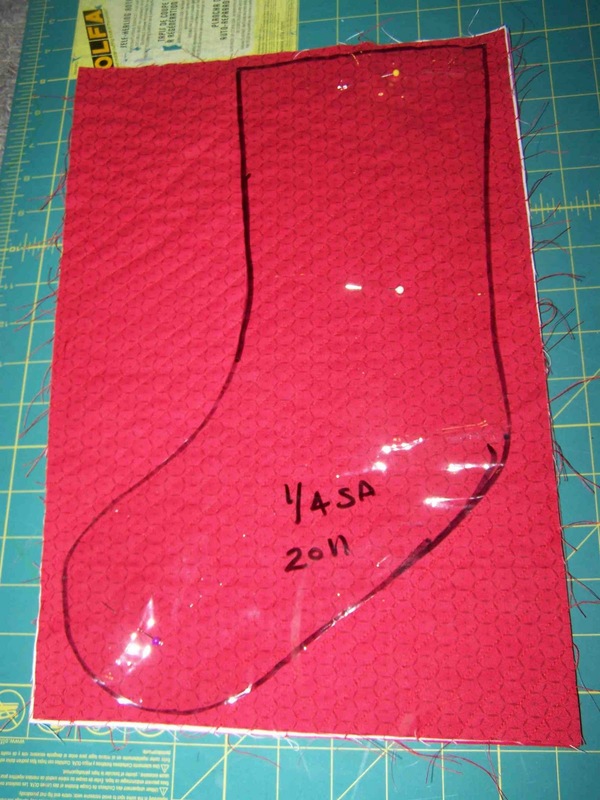 Once your rectangle is completely stitched you can use a stocking pattern to cut out your stockings pieces. Make sure that for each stocking you make you have two pieces (they should face in opposite directions when right side up-simply flip your pattern piece over when cutting out the back of the stocking). When your pattern pieces are cut out you will carefully cut the top three layers of fabric between each stitching line. Take care not to cut through your base layer. This is a bit tedious, so sit down and watch your favorite show. Place the right sides of your stocking pieces together. 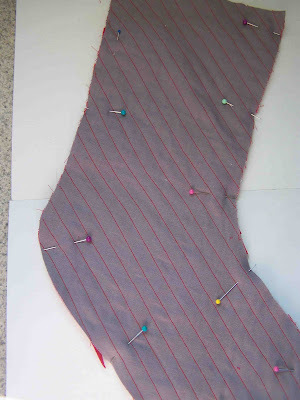 Pin in place around the perimeter of your stocking. I stopped sewing 5 inches from the top of the heel side of the stocking, the small blue pin facing the opposite direction is to remind me of that. 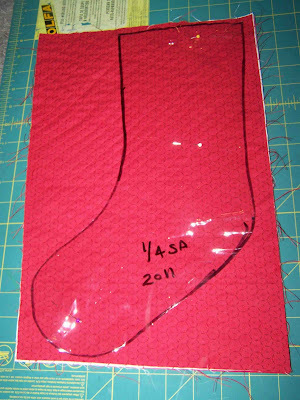 Use 1/4" seam allowances and stitch from the upper edge of the top of the stocking until 5 inches from the top of the heel side of the stocking. 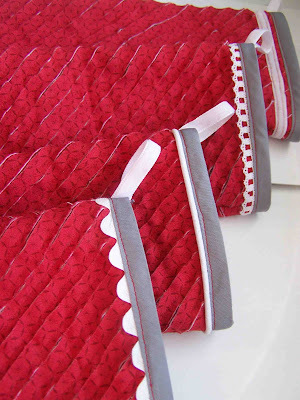 Clip the curves of the stocking to the stitching line. You may notice that I didn't clip v's on the curves. 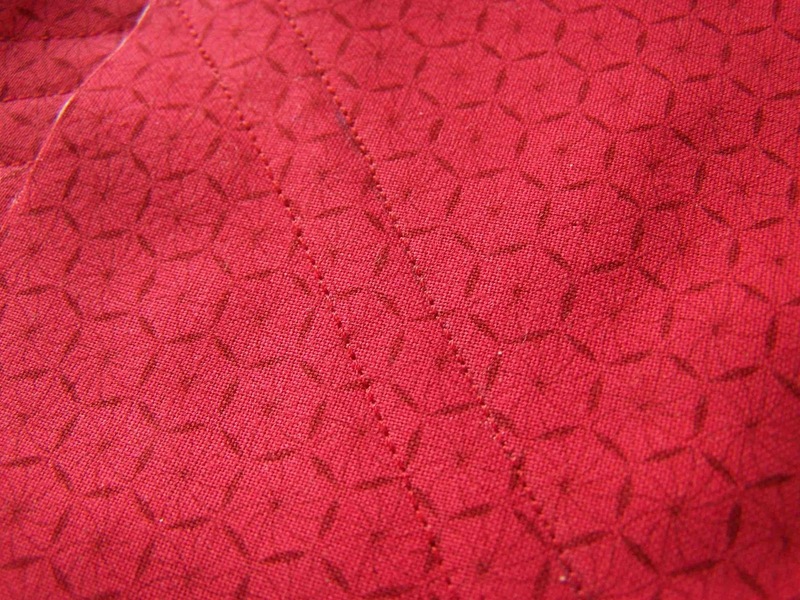 I used my serger to finish off the raw edges, and I didn't want to clip away all of the fabric. If you have an overcast serger you can serge the seam allowance. 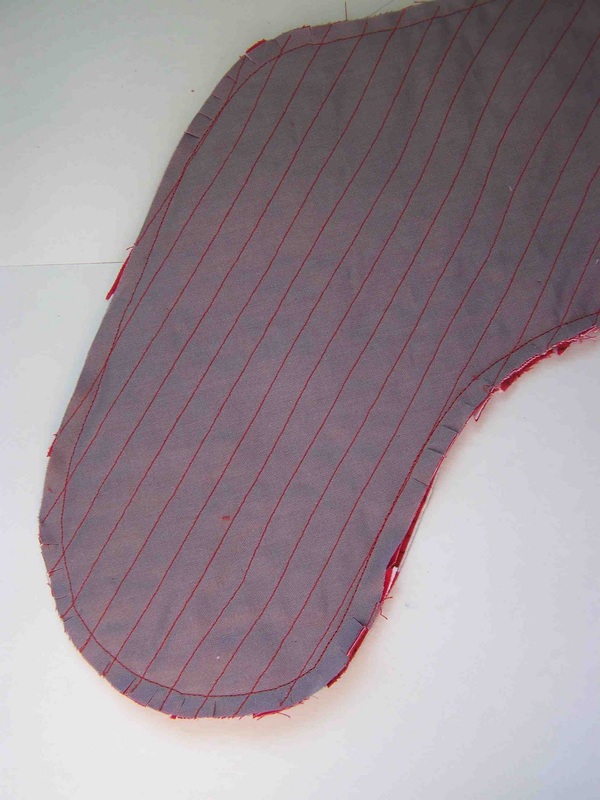 I did this in two parts: I first serged to the toe of the stocking, and then once I'd finished off the top of the stockings with bias tape I serged the remainder of the seam allowance. 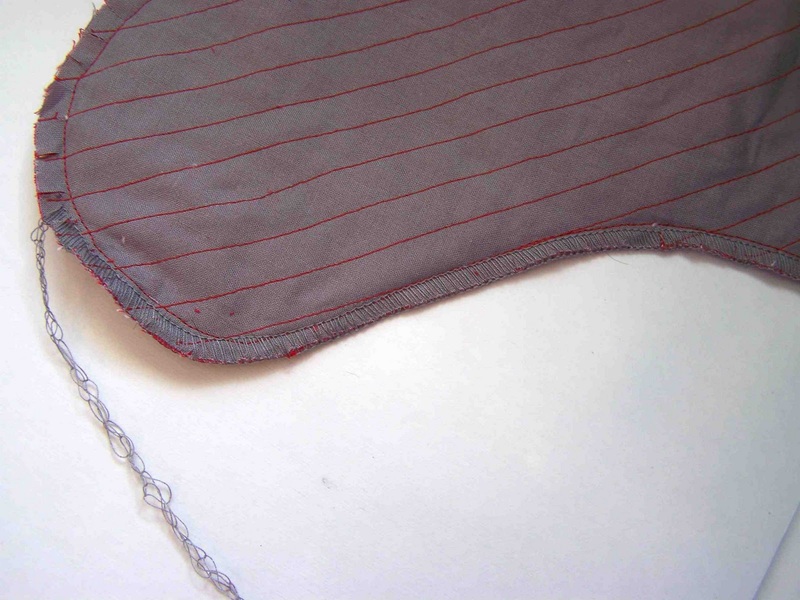 I figured that stopping at the toe would be the best place to prevent unravelling of my serged stitches. If you don't have a serger you can pink your raw edges using pinking sheers, or you can create a simple lining for your stocking. Note:If I were to create a lining I would cut out two additional pattern pieces of a single layer of cotton fabric. I'd stitch all the way around the lining using 3/8" seam allowances, and then insert the lining into the stocking with wrong sides together, prior to attaching bias tape. 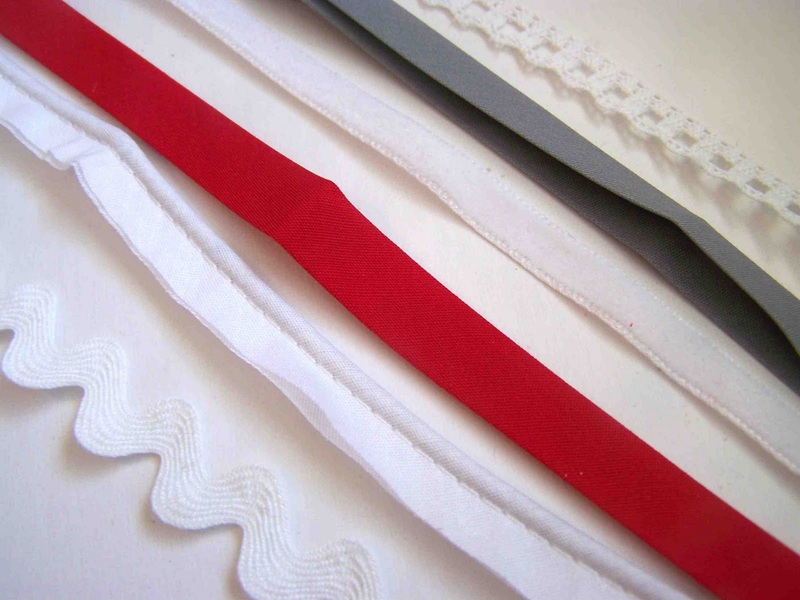 Next you will want to gather any trims that you may want to use to decorate your stockings. I using ribbon, lace, piping, and ric-rac. If you want to use piping or trim under the bias tape you will want to attach it now. Next you will attach your bias tape. 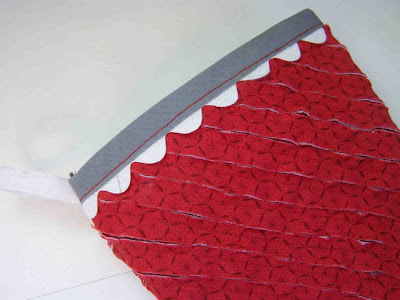 I used extra wide double fold bias tape. 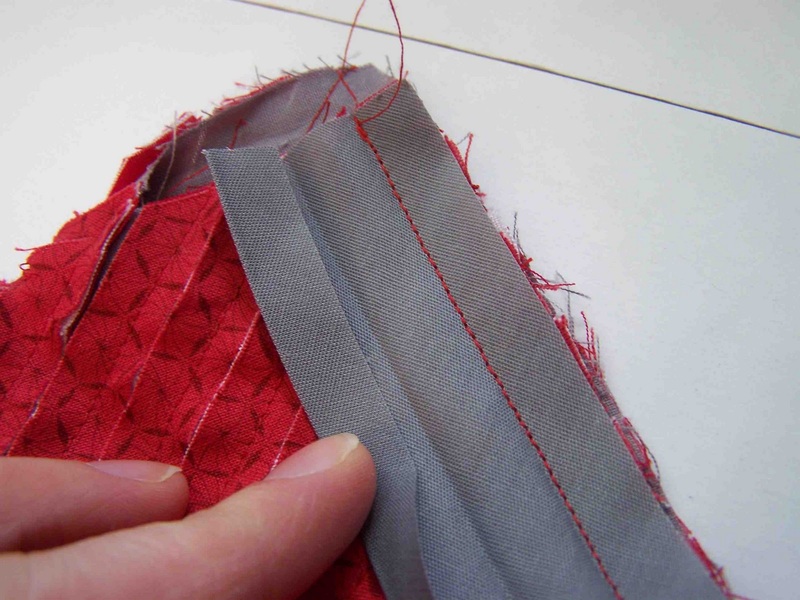 Open up your bias tape and align the raw edges with right sides together. 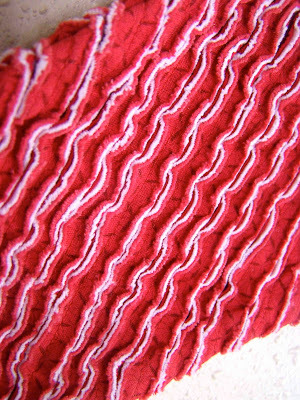 Stitch along the pressed edge all the way around the top of the stocking. 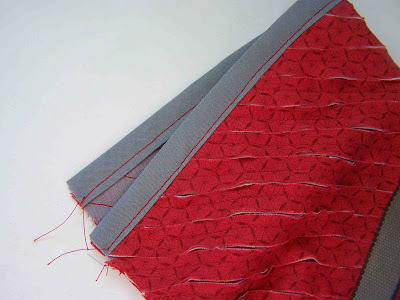 You can now fold the bias tape over the raw edges and stitch 1/8" away from the bias tape edge. 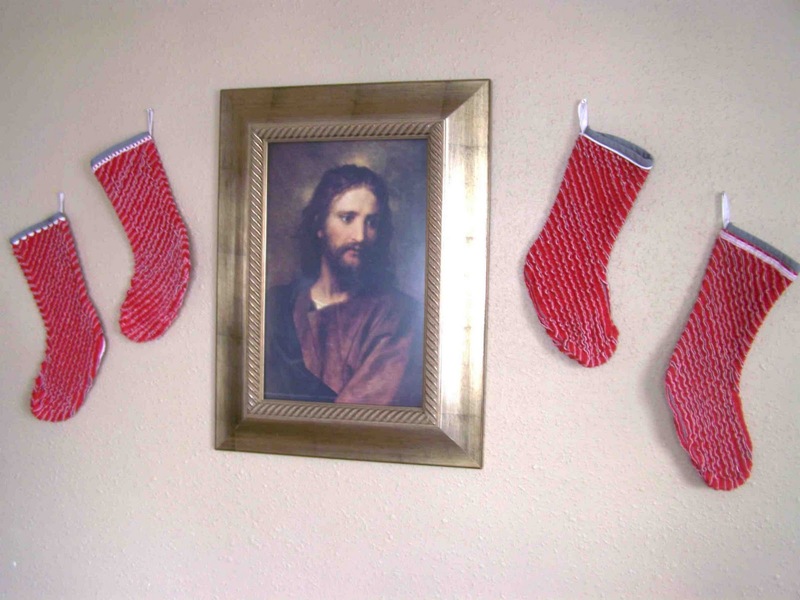 Turn your stocking wrong side out. 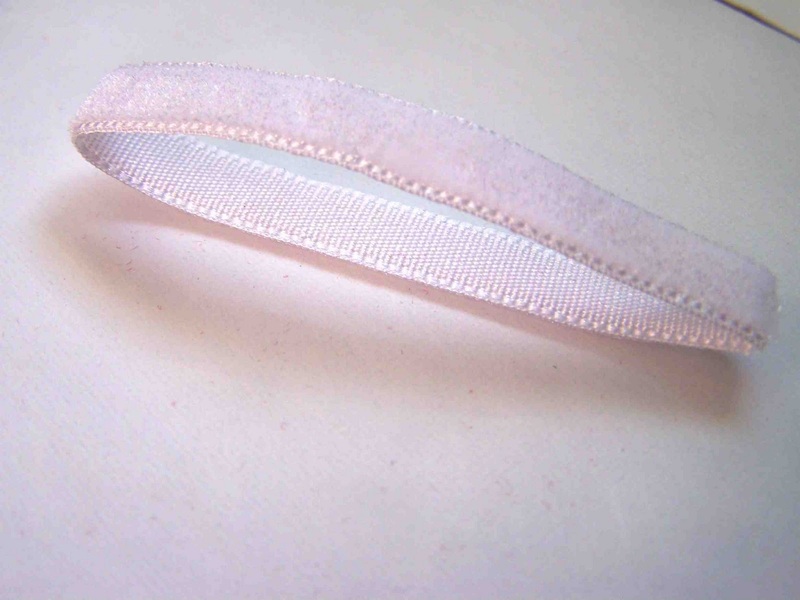 Cut a five inch piece of ribbon and press in half. Sandwich the ribbon between the two layers of your stocking. You will want to make sure that the ribbon angles up, and that the raw edges of the ribbon extend beyond the seam allowance of the stocking. 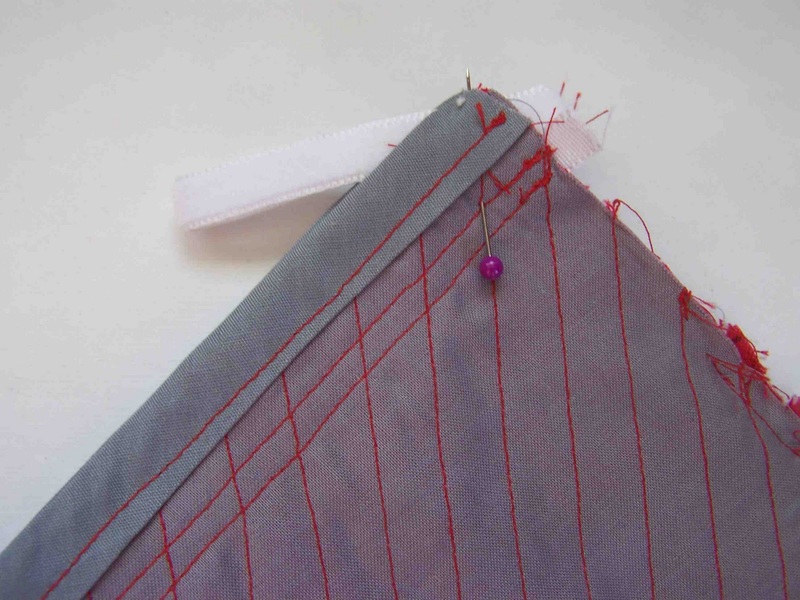 Stitch the open five inches of the stocking, securing the ribbon as you sew. If you are serging the raw edges you will want to turn your stocking inside out, and finish serging the seam allowance. Your stocking should now look something like this. 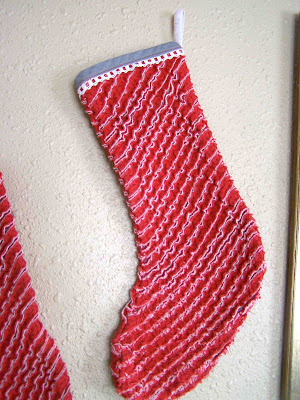 Here's what our stockings looked prior to hitting the washing machine. . .
. . . and after. 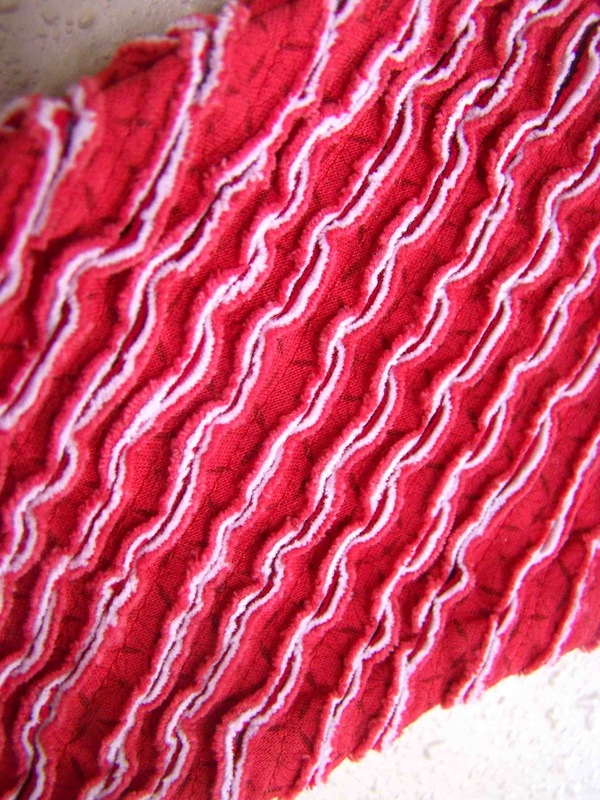 The agitation of the washer, and the heat of the dryer help to soften and curl up the edges. Thanks so much for reading! Let me know if you have questions, this was a bit of a beast to write up, I'm not sure how well I explained the process. I haven't attempted these yet, but I expect I will shortly after the new year. But from reading your tutorial, I could easily imagine each step. Good job!